If there was a petrol-driven motor vehicle on the roads of South Australia before May 1898, the press of the day was unaware: the machine to be demonstrated by French racing cycliste Mlle Serpolette was to be "the first motorcycle that the the public of South Australia has been privileged to witness". 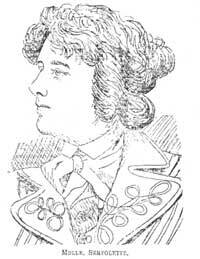 Mademoiselle Serpolette was on an Australia-wide tour accompanied by one Monsieur Lucien Ullmo, who was described as "the representative in Australasia for the Gladiator Cycle Company". The Adelaide stop-over came between similar demonstrations in Fremantle, Western Australia and Sydney, New South Wales. M. Ullmo had brought out the famous Swiss cycle racer Lucien Lesna the previous year, and clearly understood the art of promotion. Drawing heavily on the dainty Serpolette's good looks and somewhat risque wardrobe - she preferred to ride in bloomers on the continent, but in deference to the conservative nature of English-speakers she wore "bifurcated skirts" of her own design while out here - there was considerable interest generated in her visit. The tour was supported by the well-known Gladiator Cycle Co. (or its successor Clement, Gladiator & Humber (France) Ltd.) and Serpolette brought with her two Gladiator racing bicycles, and the Gladiator motor tricycle. Surprisingly, even though women's cycling was accepted in South Australia in 1898, women's cycle racing was not and it was clear well in advance that Serpolette was not to race in South Australia, as the local rules of the sport forbade it. "Mlle. 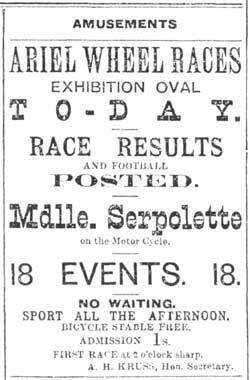 Serpollet's (sic) tricycle was the first motor out here, and well do I remember the fact that she was engaged to appear at the Ariel bicycle race meeting at the Jubilee Oval. Unfortunately the motor refused to go. The management had previously decided that if she did not give a good show they would give an exhibition the next day at noon. I was connected with the Vivian Lewis firm then, and was handed the machine to put it in working order, so that the management could keep faith with the public on the following day. Well, we fixed it up, and at 10 o'clock that morning I took it out to try it on the Belair Hill. I got as far as the Mitcham Station when a stone carter turned me into a fence, the front forks were turned back, and that settled it. The tricycle was hurriedly put into an express wagon and taken back to the city workshop, where we had it straighten up up in time for Mlle. Serpollet to give her exhibition, which was quite successful. This gave a great fillip to the interest in motoring." It was indeed a great fillip to the interest in motoring, particularly at the Lewis Cycle Works where work must have started almost immediately building the motor that was to power the Lewis motor triplet less than 10 months later. In addition to the 1913 interview, O'Grady had given a similar one to The Critic in 1908, and most of his recollections are in close accord with 1898 reports of the Serpolette visit. Only the motor accident - presumably South Australia's first - is understandably unreported in the period press. Of note, however, is some confusion about the French lady cycliste's name. All of the period references I have seen so far (more than one hundred separate articles in ten different journals in three Australian colonies, England and France) refer to her uniformly as Mlle. Serpolette, or just Serpolette. In only one is her first name revealed as Anthelmina, and on only one other occasion - when signing a letter she and other lady cyclists had written to the Pall Mall Gazette in 1896 - have I seen her identified as "A. Serpolette". On two occasions it was said that her friends called her "Serpolette". From the Critic interview in 1908 onwards (indeed up to the present day) her name has been uniformly reported - in error, so far as I can see - as Serpollet. The latter is, of course, a name more closely associated with motoring history. A local historian is pursuing the possibility that "Serpolette" was a pseudonym used by a member of the Serpollet family: we await his findings with interest. On Monday 30th May 1898 - a holiday to celebrate the Queen's birthday - Mlle Serpolette received a capital reception when she appeared on a single (bicycle), and covered a couple of laps accompanied by Courtney. The motorcycle demonstration, as we know, did not go to plan when "the petroleum refused to work, and the machine would not go", even though it went splendidly on Saturday and on Monday morning. 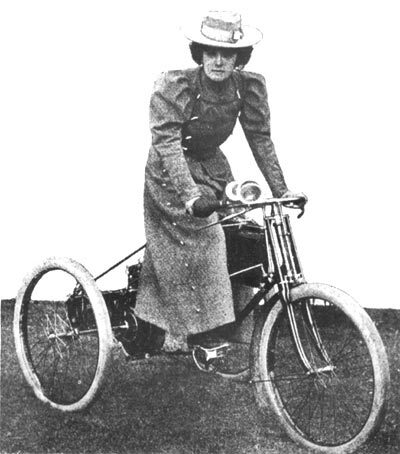 Afterwards, Mlle Serpolette commented: In Paris such a failure would have caused a disturbance while the motor would probably have been broken up and the spectators would have demanded their money back. In Wakefield-street it ran splendidly and bolted from some cyclists who intended to accompany the rider. A more moderate pace was set in King William and Rundle streets, and then two satisfactory exhibitions were made on the oval. In the first one, Mdlle. Serpolette rode several laps at a good rate and half an hour later another short trial at about 20 miles an hour was made. There were hundreds of people present and mademoiselle was loudly cheered. The machine, although fairly satisfactory, does not yet run as it should, as the petroleum which has to be used is not as good nor as powerful as it could be. In fact the machine acted up again on the return journey from the oval, and was pushed back to its quarters. Poor fuel was most likely the cause of all the problems. The surface carburettor used on machines of this period required highly-volatile 0.680 specific gravity fuel. Unless stored with extreme care, the more volatile fraction of the fuel would evaporate, leaving a "stale" residue. This important lesson was learned early on at the Lewis Cycle Works, and they were to build themselves a specialised fuel storage facility - about which more later. Mlle Serpolette and her entourage left for Sydney via Melbourne on the Tuesday express, leaving behind the seed from which the motor industry in South Australia would grow. Links with the Lewis Cycle Works?